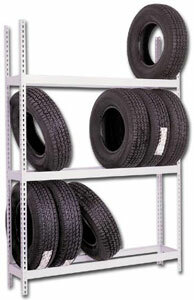 Material Handling Solutions offers an economical & effective way to store and display tires with our Rivet tire racks. Our durable 14 gauge tire racks are easy to assemble and they donâ€™t require any special tools, they just snap together. Particleboard orÂ wire decking is optional and can be ordered separately. We also offer a wide variety of other types of industrial and commercial equipment. We have a huge inventory of pallet racks and we can usually ship any order within 96 hours or less. Feel free to call us toll free with any questions you may have and one of our specialists will help you find exactly what you are looking for.